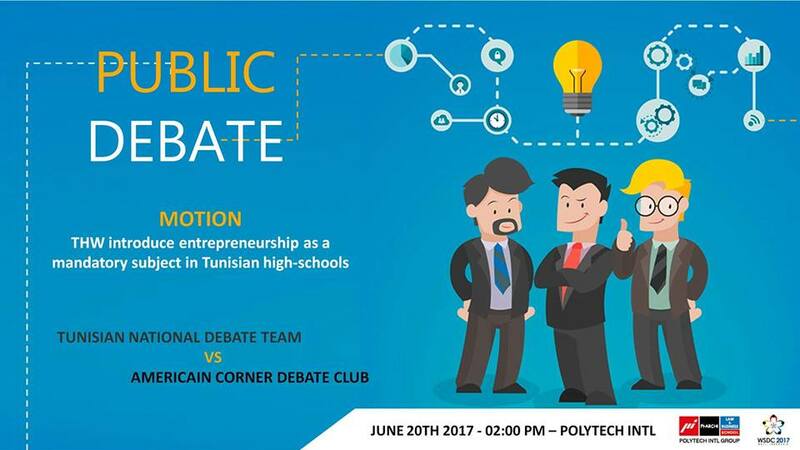 Tunisia’s National Debate Team will be holding its first public debate! on June 20th, 2017. The Tunisian National Debate Team is the culmination of months of work and dreams from the debate community. It is the result of effort from debate education activists from different organizations around the country, who aim to elevate the level of sophistication and excellence in the community, with the aim to meet international academic standards. This team will be representing Tunisia in the World Schools Debate Championship, or WSDC, the world’s most prestigious high school level debate competition. The competition will take place in Bali, Indonesia in August 2017. The public debate is hosted by Polytech International, a private university, and will commence at 2 pm. The topic will be the integration of entrepreneurship education in Tunisian public high schools. In addition to the national team, the debate will feature members of the renowned American Corner Debate Club, one of the oldest in the city of Tunis.